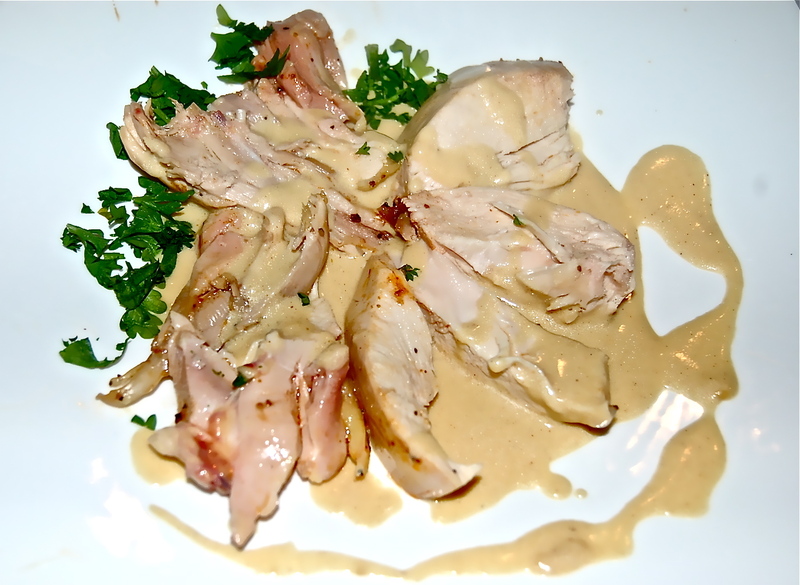 On August 29th I posted a recipe for “the perfect way to prepare a roast chicken”. I had a theory about people who enjoy cooking. When the recipe is intricate, it becomes a welcoming challenge. Cooks seem to flourish on keeping their hands and their minds moving. I certainly do, and last evening’s 7-stage technique to perfectly roast a chicken was the evidence. The original concept was by David Bouley and dates back to the early nineties from his restaurant in Tribeca. This post is his original recipe. According to Cath, “this will be the only way to ever prepare Chicken again”. 1. Preheat the oven to 375 degrees. Boil enough water to fill half the bottom of a roasting pan. 2. Wash & dry the Chicken. Remove the first two joints of the wings, & discard. Stuff the inside of the Chicken with Thyme, Rosemary, Sage & the Garlic Cloves. 3. Rub Lemon, Salt & Pepper all over the chicken. Sprinkle liberally with Paprika to coat completely. Place the Chicken on a rack set on top of the roasting pan, & steam over the boiling water for 20 minutes. 4. Remove from the oven, place the steamed Chicken on a vertical roaster. Pour off the water & place the Chicken into the now empty pan. Reduce the oven to 360 degrees, & roast the Chicken for about 20 minutes longer or until the juices from the breast run clear when cut with a knife. 5. Remove the Chicken from the vertical roaster, cut off both legs at the joint where the thigh meets the body. Return only the legs to the pan & roast about 10 minutes longer. Allow the whole Chicken to resettle for 10 minutes, then remove the herbs from cavity. 6. Remove the entire skin. Cut off the breasts in one piece & slice 1/2 inch thick on a diagonal. Remove the meat from the leg & cut them into bite-size pieces. 1. In a small sauce pan, add the TB of Butter. When it stops sizzling, add the chopped Shallot & saute until translucent. 2. Add the next 4 ingredients & whisk to combine. If the sauce needs to be thinned, add Chicken Broth a tsp at a time. Set aside.